Australian food producer SPC has received top recognition in the food category at the 2018 WorldStar Packaging Organisation Awards on the Gold coast on May 2 2018. An international innovation, SPC ProVital was recognised by the global industry for the design of its accessible food packaging solution. Developed to address the key issue contributing to rates of poor patient nutrition within hospitals across Australia, years of research inspired SPC to commission the project –concluding with a range of easy-to-open cups. Key packaging design features of the SPC ProVital range which contribute to improved overall user experience include a textured and lengthened pull tab for easier grip, clear instructions for opening, decagon shape for easier grip, and optimised seal to reduce force. Collaborating with NSW Health, SPC engaged design and packaging suppliers to create an easy-to-open cup using guidelines provided by NSW Health and Arthritis Australia. “The issue of packaging accessibility is becoming more and more prominent in our society as the population ages,” says SPC Category Marketing Manager ProVital, Chris Deed. “For us, having our range receive the highest possible accessibility rating from Arthritis Australia of +8, with 95% of the population reporting an easy-to-open product is one thing, but to be recognised by the WPO with an award of this stature, is something that makes the journey so worthwhile,” says Deed. “It is essential that packaging of food served in hospital is easier for patients to open in order to support their nutrition outcomes,” said Carmen Rechbauer, Executive Director, Clinical Support Services at HealthShare NSW. “Easy open packaging not only contributes to improved nutrition in hospitals, but it also allows our most vulnerable patients to retain their independence and dignity by easily accessing their own food,” said Carmen. SPC Category Marketing Manager ProVital, Chris Deed says his team are “particularly proud of this innovation as it represents how industry, supplier and corporate collaboration can result in increased efficiency for our customers – a growth platform for SPC as a business”. 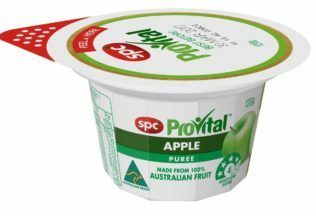 SPC ProVital products are currently available through hospitals and aged care facilities, with further plans for expansion. Will the arrival of AmazonFresh really shake up Australia’s supermarket industry? A new line of gluten-free biscuits made out of buckwheat is hitting Australian supermarkets.